The LA Philharmonic launched a spectacular micro site celebrating the arrival of Music Director Gustavo Dudamel. The attention to social details is quite amazing. What I love about the site located at http://www.laphil.com/gustavo, is that it features so much share-able content. My favorite example is this video of Members of the Los Angeles Philharmonic, celebrities, and LA residents welcome Gustavo Dudamel to Los Angeles in a video shot at Walt Disney Concert Hall, Santa Monica beach, the Griffith Observatory and other L.A. landmarks. Christmas Day gave me a chance to dig to the bottom of my ON: In Box. Here is a cool one from the creative minds at RGA. A simple ornament tool allows you to upload your photo and make an ornament wish of it! Just in case you need a new agency ornament while packing away the Christmas tree this year use this fun tool to make one. They say that no 2 snowflakes are the same, despite looking identical to naked eye. That is probably also true when looking at them through the lens of this great Snow Flake maker. Today I received a snowflake from a friend. When I followed the link back I was delighted to see a "create a snowflake tool". I must admit I have made about 10 different flakes and sent them out. It is addicting. The folks at Popular Front are smart marketers too! Check out the badges they created for people to lift and put on their sites! 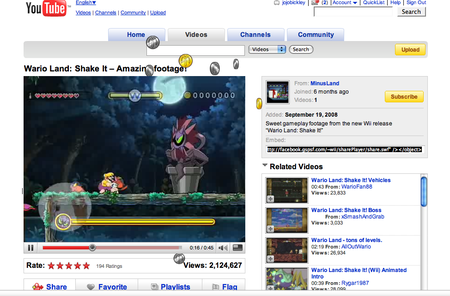 When I logged into to my Facebook account today, I stumbled upon the featured video in my dashboard. Upon click I fell for it! I love this campaign... Simply Big. 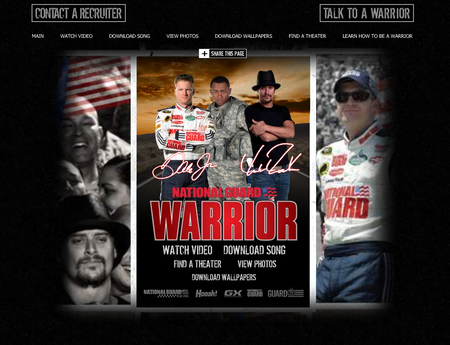 Kid Rock teamed up with Dale Earnhardt Jr. for the a new National Guard promotion "Warrior". Kid Rock wrote the new song, 'Warrior', that is the featured song in the campaign. They used epic director James Mangold to shoot the videos. (Mangold has done Walk The Line and 3:10 To Yuma) Make sure to go to the site and download the song! Don Julio recently joined the myriad of spirits companies toying with how do they take the most socially consumed products in the world and apply them in to social media. There is nothing more social than sharing a drink with friends. Combined that with the "Authenticity"campaign and what you get is an authentic way to create a drinking experience. 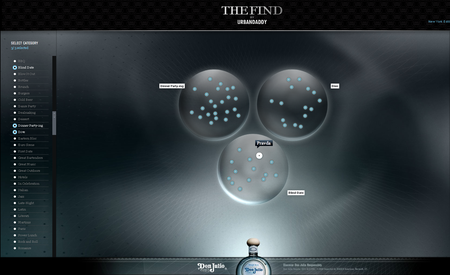 Don Julio has taken a smart idea and instead of trying to re-invent their site, they did the distributed media thing.They partnered with one of the hottest online blogs. Don Julio + UrbanDaddy = a brand faciltaing their consumers drink finds. I love that they highlight both great accounts in the trade as well as distinguishing places that the perfect find with fun categories like "First Date", "In Celebration", "The Bankers", "True Love" and my favorite "With The Parents"
The folks at Interaction 08 came from a many different areas of the business (Graphic design, Information Architecture, Industrial Design, Programming, Development and Web Design to name a few) Over the last year one of the trends I have seen has been the inability to firmly define our practice in universal terms. I ponder if in 2008 we will begin to unify the meaning of what we do. Some in the industry believe in order to properly sell what we do we must agree that we as "creatives" must decide what to call ourselves. When you combine design, engineering and marketing, what you get are the fundimentals of digital that have converged to play a dominant role in consumers lives. I was catching up on prototyping tools this week when I was introduced to Adobe's gave new RIA-Builder, Thermo. The demo showed how to take a Photoshop or Fireworks-generated screenshot and transform it into an interactive Flex UI that can be edited in FlexBuilder. This new tool is aimed at designers and will be out in 2008. Applications created in Thermo are Flex applications that can be loaded directly into Flex Builder, providing a great workflow for designers collaborating with developers. The designer's work can be incorporated directly into the production application with no loss of fidelity, and designers can continue to refine the design throughout the iterative development process. From the time that I was introduced to it, I wanted to see a brand application of Papervision3D. PaperVision3D was one of those new shiny toys that looked amazing! - When Flash 9 came to market the speed to do simple 3D became an obsession for most flash designers. Several started to create their own 3D engines and PaperVision3D was the project that offered the most promise. That promise has now been realized by Good Technology in London. 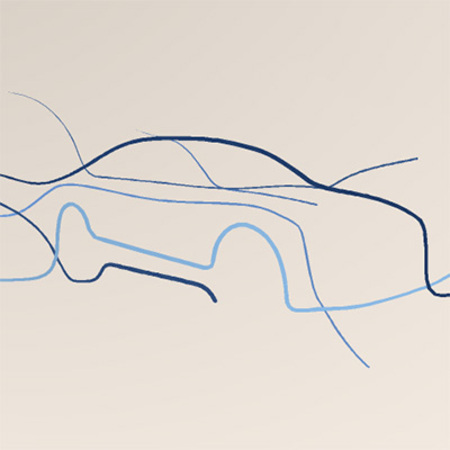 It has just launched Rhythm of lines, a promotional site for the new Audi A5, using Papervision3D. By using the mouse and keyboard, you create your own rhythms of lines and store them in your gallery. You can then play them back and use them as desktop wallpaper or screensaver. They have also extended the functionality so that you can submit your work to the exhibition, where a selection will be printed in large format. Based on Lines, the Audi A5 spot the whole experience flows beautifully, creating a truly immersive atmosphere. Very polished and well executed, everything fits together nicely, from the art direction to the music. Papervision3D has posted this reel of eye candy. As a kid I was always a big fan of sitting with the family back home in San Antonio and playing boardgames like Life. 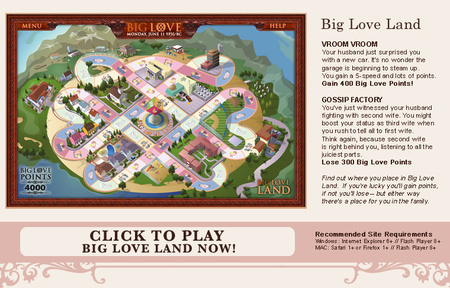 When I caught a glimpse of Deep-Focus' virtual Salt Lake City I immediately clicked through to play the game of Life as a polygamist. This time Ian and Deep-Focus took a simple idea and put two runners on base. At first blush I found the instructions to be a bit confusing. The use of natural progressors or even integrated instructions would have made the app much easier to navigate which would have made it a home run.